The Elephant Court is the one and only five star hotel available just next to Periyar Wildlife Sanctuary, India’s largest wildlife sanctuary. 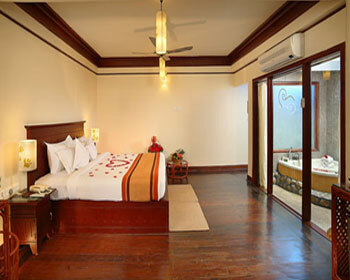 Surrounded by exotic spice plantations and dense rainforest, the guests can feel at home amidst natural surroundings. 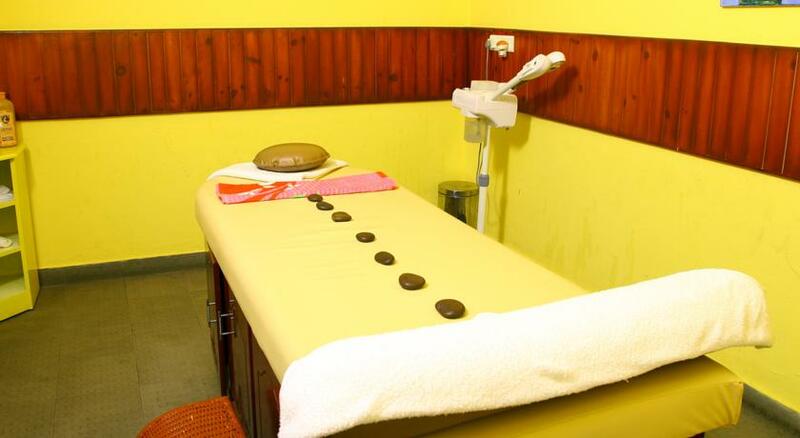 Apart from the wonderful living spaces, the hotel boasts of numerous contemporary facilities and age old Ayurveda spas to make your trip truly memorable from all angles. The kidney shaped swimming pool comes with a separate paddle pool for the kids along with deck chairs to soak the daily sun. The poolside bar starts operating as soon as the sun goes down and serves authentic beverages to the guests. Also available is ample space for indoor games like carom, table tennis and badminton etc. to enable the guests enjoy with their friends and family. If you are one of those who love reading, then the library at the Elephant Court will satisfy all your reading requirements. It comes equipped with latest publications which one can enjoy while enjoying the scenic natural surroundings. 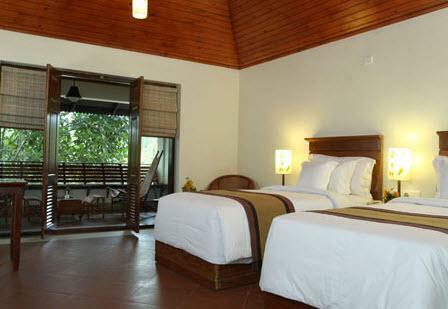 The view of the Thekkady forest can be enjoyed by going to the rooftop which offers amazing view on the moonlit nights. For the people who have business on their mind, the hotel provides two conference halls that are well equipped with projectors and other conferencing products. 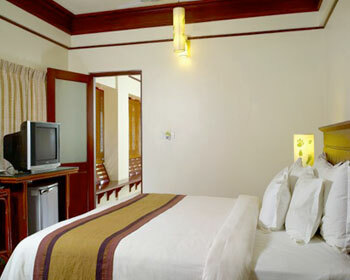 The hotel also offers Gymnasium, Yoga Center and Spa facilities to all its esteemed guests. 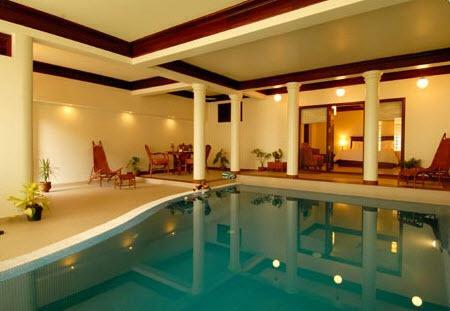 The Pool Studio at The Elephant Court can be best described with the availability of your own private pool in your living room. The swimming pool provides ample of opportunities to enjoy an intimate and private time with your partner. During the day, the room gets a soft diffused light that causes shadows on the walls. At the same time, the water also spreads its aura on the contemporary furniture and furnishings combined with traditional charm and hospitality. Some of the state of the art amenities available at the Pool Studio include a comfortable double bed, attached bathroom with branded premium toiletries, running supply of hot and cold water, Tea/Coffee maker, daily housekeeping, direct dial telephone with STD and ISD facility, satellite television, in room dining and more. 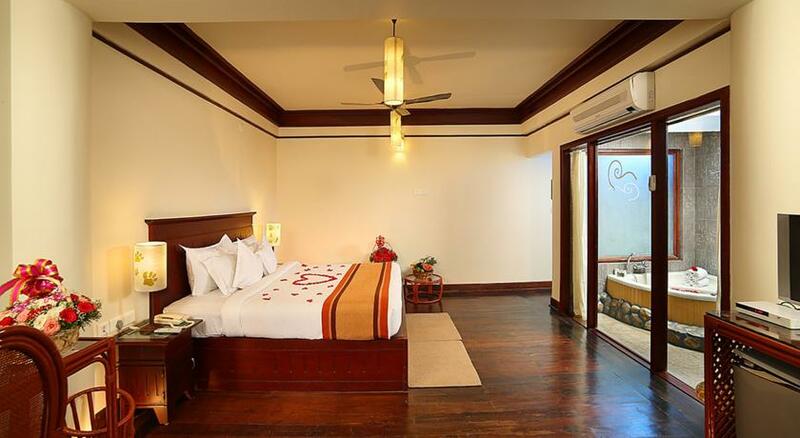 The Elephant Court offers wonderful Honeymoon Suites for the couples who want to enjoy the moments of passion and solace of intimacy. These suites come with a glass walled Jacuzzi which is lit with the skylight that comes from the frosted glass fitted above. The frontiers of pleasure get unrestrained and expanded once you decide to spend your honeymoon in these amazing accommodations. These suites are furnished in natural textures and tones and provide a breathtaking view. The state of the art amenities combined with the traditional touch ensures that each of the guests enjoy their moments to the maximum. Some of the amenities available in these suites are a comfortable double bed, colored television with satellite channels, direct dial telephone facility, daily housekeeping, round the clock room service, attached bathroom with 24 hour supply of hot and cold water, branded premium toiletries, in room dining and more. The Garden Suite of The Elephant Court combines the contemporary styling with traditional touches. 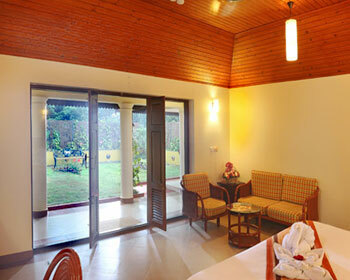 These suites are provided with a secluded garden. 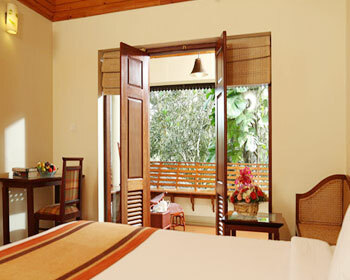 As soon as you step out of the suite, a verandah overlooks a charming garden with fish pond. 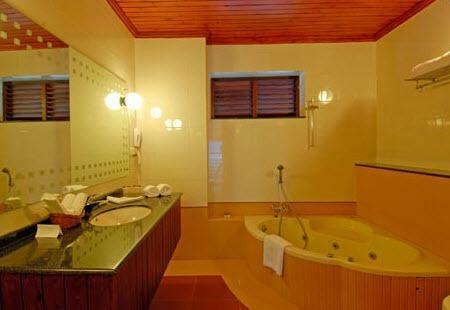 These suites come equipped with a Jacuzzi and many other amenities to provide all possible comfort to the guests. 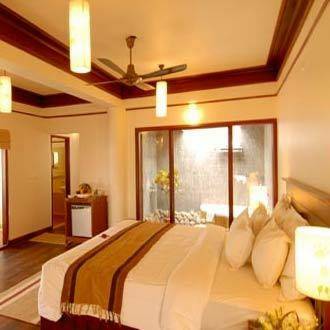 They are the best options to stay for the nature lovers who wish to enjoy each and every aspect of the natural surrounding be it the sun rise or the rain water that comes down during the monsoon. 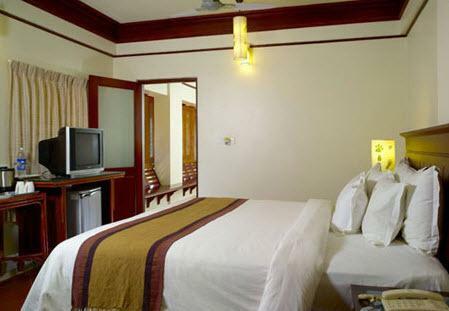 Some of the facilities available at these suites include a colored television with satellite channels, 24 hour room service, telephone with STD and ISD services, attached bathroom with running hot and cold water supply, premium branded toiletries, in room dining, daily housekeeping and more. Well-appointed with twin beds, a toilet and a bath, the Patio rooms have roofed patios that extend outwards from one end of the room. 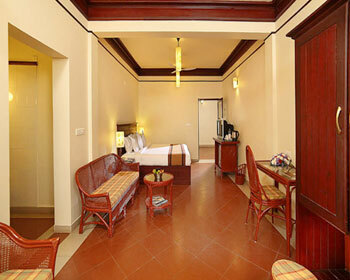 Traditional Kerala architecture along with state of the art amenities make up these rooms. 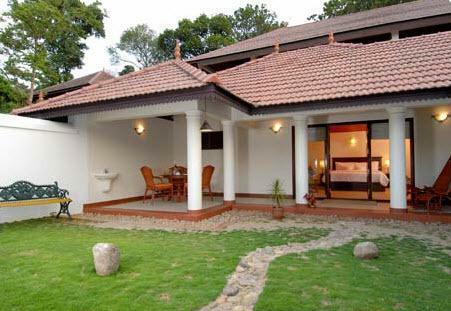 The Patio rooms at The Elephant Court offer hint of outdoor with a sense of privacy. Some of the facilities available in these rooms include LCD TV with satellite channels, small refrigerator, Tea/Coffee maker with complementary sachets, telephone with direct dial STD and ISD facility, attached bathroom with running hot and cold water, premium toiletries and more. The Family Enclave at The Elephant Court are the spaces wherein both large and small families can stay together and enjoy each and every moment. Not only that you can enjoy a family time but also have privacy as and when you desire. If the kids want to play, a separate area has been provided in these suites. 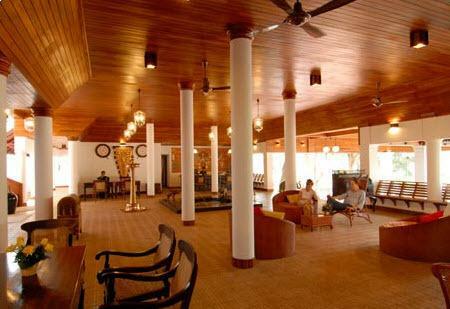 Decorated with contemporary furnishings along with traditional artifacts clubbed with age-old hospitality, the Family Enclave is the perfect accommodation option for the families travelling to Periyar. Some of the facilities available at these suites include round the clock room service, daily housekeeping, colored television with satellite channels, telephone with direct dial STD and ISD facility, attached bathroom with separate shower area, running hot and cold water, premium toiletries, Tea/Coffee maker with complimentary sachets, sofa set, comfortable beds and more to ensure that each guest has a memorable stay in Periyar. 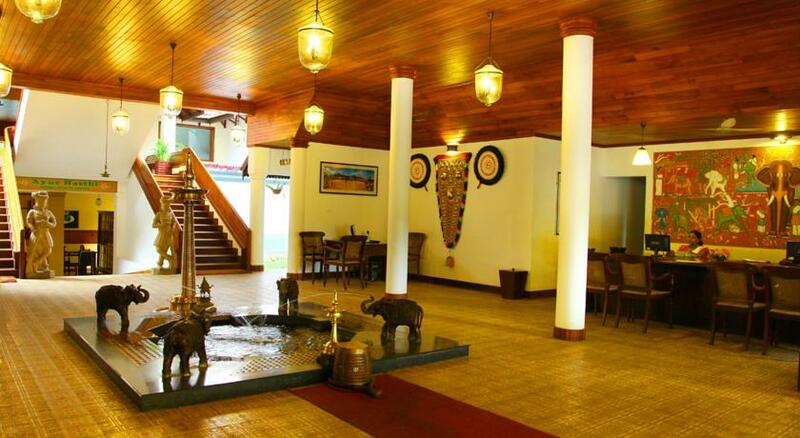 The executive enclave at The Elephant Court is the perfect accommodation option for the people who have come to Periyar for some business reasons. These accommodations enable them to have a luxurious stay and at the same time, conduct their business meetings, conferences, presentations and product launches etc. in complete comfort. These rooms come with separate living and work areas to work effectively and at times, get away from it all. 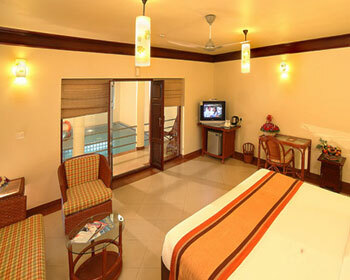 These suites come equipped with state of the art amenities along with contemporary décor and styling. Some of the facilities that you can look forward to are a comfortable double bed, work desk with chair, attached bathroom with premium toiletries, running hot and cold water supply, daily housekeeping, round the clock room service, daily newspaper, colored television with satellite channels, telephone facility with direct dial STD and ISD, in room dining and more. The in house multi-cuisine restaurant at The Elephant Court offers delectable Indian and International cuisines to all its esteemed guests. Apart from that, the experienced chefs also churn out some exotic local delicacies. The royal furniture, textured walls and ancient style interiors offer an amazing ambiance to enjoy these culinary delights to maximum. 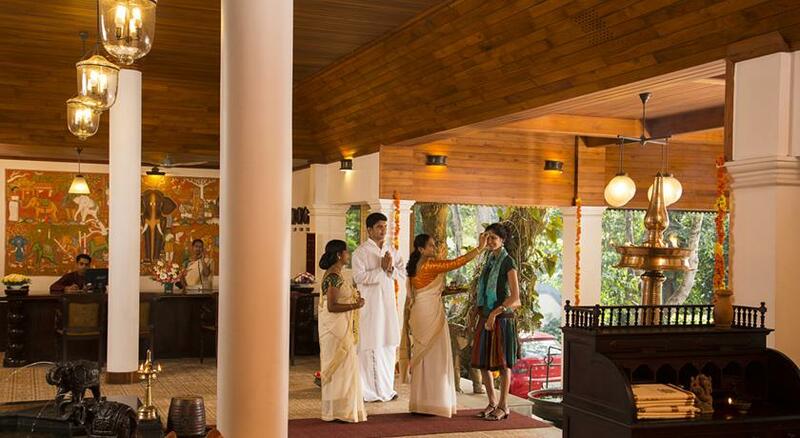 The staffs of the hotel leave no stones unturned to serve the guests to their maximum. All in all, the lovely décor and amazing quality of the food is very amazing and will ensure that you have a wonderful dining experience when you come here to have breakfast, lunch and dinner. If you need a mid-day refresher or if you suffer from untimely hunger pangs, then head straight to the Coffee Shop at The Elephant Court. It has been developed by the hotel to cater to the travelers and business guests who are always on the move and need to grab a quick bite. An array of hot and cold beverages is served here to keep the guests refreshed throughout the day. A large number of snacks and mini meals are listed in the menu which will keep the patrons fully satisfied. You can be seated comfortably while you enjoy the beverages with delectable snacks in the delightful décor. 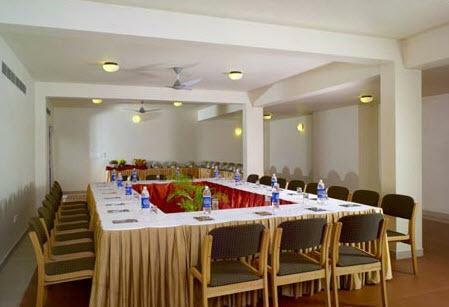 It is also an ideal venue for formal to casual business meetings. 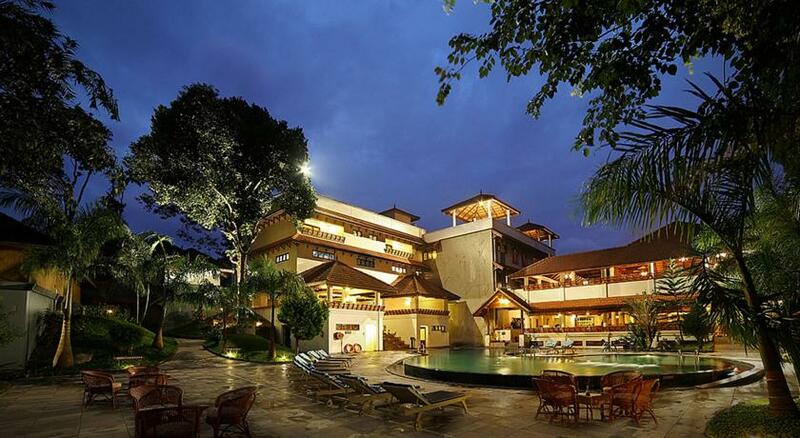 Want to enjoy an evening by the swimming pool after having a tiring day? Just head to the poolside bar wherein you will enjoy an assortment of cocktails, malts, wines, mocktails and non-alcoholic beverages too. The guests can also complement their drinks with delectable finger food and snacks that are available on the menu here. 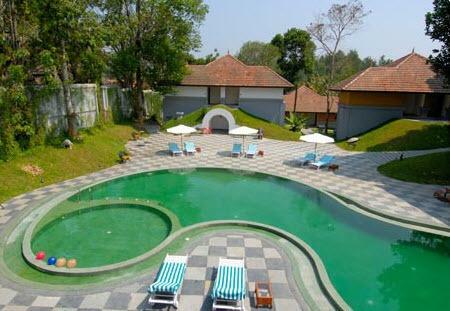 Alongside, you can take a dip in the cool waters of the swimming pool. Enjoy in the company of your spouse, family and friends at the Poolside Bar in The Elephant Court.